Riverbed AirPcap NXMetageek WiSpy DBxD-Link DWA-160Cisco-Linksys WUSB600Nv1D-Link DWL-122D-Link DWL-G122Ubiquiti SR71-USB (w/ two HG2401RD-MMCX 2.4 GHz antennas) I do, and it stinks. AirPcap is for Wireshark, WiSpy is for Chanalyzer, the DWA-160 and SR71-USB are for AirMagnet software, the DWL adapters are for Kismac and the Cisco-Linksys is for OmniPeek. It is a bit frustrating, especially if I need to switch between applications. Well, today I am a happy(er) man. The screen in that shot is WildPackets OmniPeek, running like a champ. And do you see that little thing on the right, there? 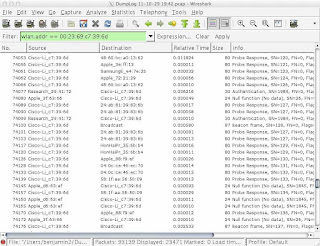 That is the D-Link DWA-160, working with OmniPeek like a champ. The darned computer (or phone, or tablet) won't connect. We've all been there, and we've all wondered what the heck the problem is. Here's a quick way (using an OS X 10.7 [Lion] Macbook Air with Wireshark) to start yourself on the road to figuring out why. I'm on a connection kick as of late, so let's follow up the last post on this blog by going into a little more detail about WiFi connections. If you understand 802.11 protocols, then things can be taken a little deeper. When your (or the people you support's) WiFi connection seems to be unavailable for no reason, you can look at the frames being sent to see if things are going the way they're supposed to. We've all encountered bad WiFi networks in the past. Is there anything (besides cursing the admins) that can be done about it? There is a fantastic phrase going around nowadays that is used to describe all manner of first-world problems: white whine. Complaints about the quality of guest WiFi certainly would fit into that unfortunate category, but I'm going to join the white whiners anyway (while throwing in a few helpful sniffing tips so that I feel better about myself). Channel choices can be a tricky thing, especially in the 2.4 GHz frequency band. I saw a network recently that had an unconventional channel design, but the network seemed to work pretty well. I believe in sniffers. I believe in planning for client roaming. And I believe that mixing the two is a bad idea. Using a sniffer the right way and planning for client roaming the right way are both essential for having a high quality WiFi network, but it's a good idea to keep the two separate. This is, of course, a blog about WiFi sniffing, but to understand why using sniffers to plan for roaming is trouble, let's go into some background on WiFi client roaming. Readers of this blog may have noticed that my frequency of blogging has waned in 2011, so it's time for some self-motivation. I'm going to start a series of blog posts titled, "Three Things I Like" and apply to all sorts of WiFi (and possibly even some non-WiFi) topics. I'm going to start with a darned good WiFi sniffer, Fluke Networks' AirMagnet WiFi Analyzer. 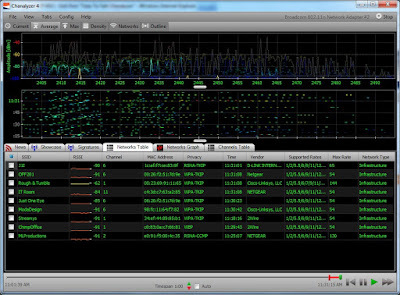 AirMagnet WiFi Analyzer from Fluke Networks has long been the leading WiFi protocol analyzer by market share. It has also long been one of my favorite tools to use when helping others learn about WiFi. 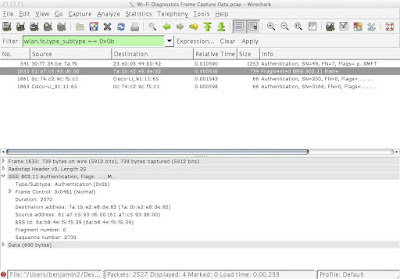 Here are three things that I like about AirMagnet WiFi Analyzer. Last Sunday I took a flight equipped with Gogo in-flight WiFi so that I could work in an office with guest WiFi. The difference in security was stark, and Gogo should make changes to fix their poor (and, in my opinion, negligent) WiFi security. The CWDP Study Guide was recently released. The certification is valuable and the study guide is great as a reference, but as a book it is just about unreadable. Certified Wireless Design Professional (CWDP) is a new certification from the CWNP Program, a group that creates and manages vendor-neutral WLAN certifications. The CWNP Program has long had a Certified Wireless Network Administrator (CWNA) and Certified Wireless Security Professional (CWSP) certifications, and here in 2011 they are adding the CWDP and Certified Wireless Analysis Professional (CWAP) certifications. It should come as no surprise that many WiFi-enabled mobile phones sometimes exhibit behavior that makes them vulnerable to attack. In at least one case, you can use a WiFi sniffer to view such behavior so that the proper changes can be made to your phone. When a WiFi device associates to an access point, it must first go through the process of Discovery so that it can decide which AP is best (based on SSID, signal strength, etc.). Discovery is done either by listening for Beacon frames or transmitting Probe Request frames in hopes of eliciting a Probe Response frame. The Discovery process reveals the same information about an access point (SSID, channel, rates, security, etc.) whether it is through a Beacon or a Probe Response, it's just that the probing process can be faster because the station can initiate it at any time. UFC 125 happened on New Year's Day, and I was fortunate enough to cover the show for the Wrestling Observer. As with just about every sporting event nowadays, the MGM Grand Garden Arena provided WiFi service for the members of the media who were covering the event. I managed to squeeze in a little bit of sniffing while I was doing my live blog, and the results I found were a little bit surprising to me. When I think of public Wi-Fi, I think of downloads. Maybe that makes me an old codger, but I just imagine all of these web pages, videos and spam emails coming down with just a few requests and acknowledgments going back up. The world has changed, of course, with more people than ever wanting to tweet, blog and upload photos as part of the social media revolution, but I still was dubious when Andrew Von Nagy (@revolutionwifi) told me on Twitter that I should expect a pretty even distribution of data on any public WiFi network nowadays.